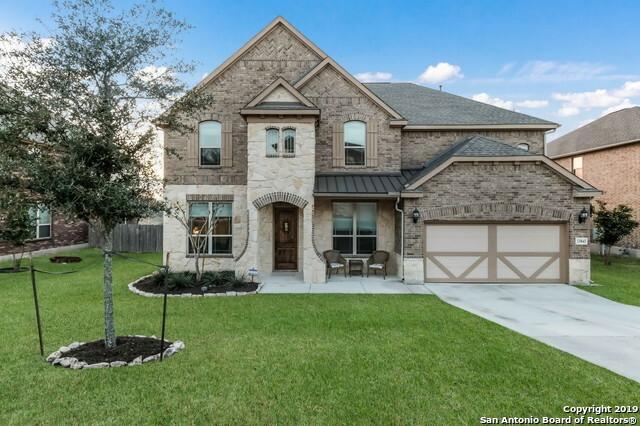 All MOUNTAIN LODGE homes currently listed for sale in San Antonio as of 04/20/2019 are shown below. You can change the search criteria at any time by pressing the 'Change Search' button below. "SPECTACULAR!!!! 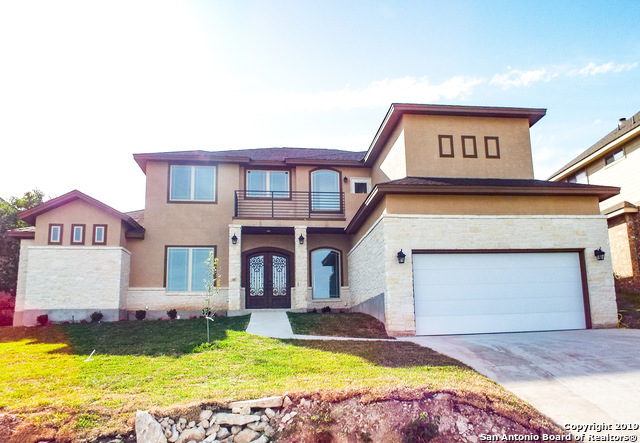 3837sqft, 4Br, 4.5Bath Brand New Custom home in sought after Mountain Lodge. LOADED to 10's w/high end finishes. 2Br's down & 2Br's up. Huge Media Rm 7.1 surround. Every room has an bathroom that is finished out w/granite & the finest materials. Tons of recessed light throughout, Double wrought iron front doors, porcelain floors, no carpet or cultured marble anywhere(all granite), .39 lot across from community pool, open floorplan w/2-story family rm & foyer. 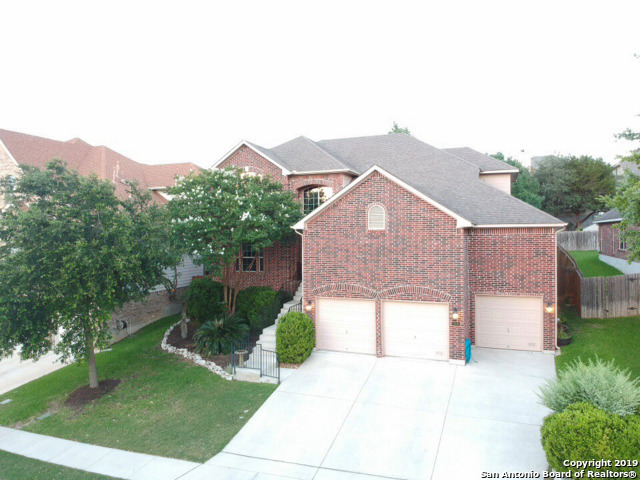 NEISD Schools, No Ci"
"Impeccable,contemporary custom home in highly sought after Mountain Lodge. This captivating,like-new home has a spacious open floorplan w/ large granite gourmet island kitchen,pot filler at gas stove,stainless steel appliances & spacious counter seating.Downstairs-Master suite w/bay window & luxurious en suite bathroom.Add'l guestroom & spacious full bath.Upstairs-4 large bedrooms & 2 full baths,built-in desk & gameroom w/ balcony & Upgraded wood-look ceramic tile.Beautiful view w/gentle rolling"
"IMMACULATE 4105sqft 4Br, 3.5ba, w/formal living rm, gameroom & media rm. Mercedes built Home w/STUNNING view located in sought after Mountain Lodge. AWESOME floorplan w/curved staircase & lots of architectural detail. Enormous kitchen w/HUGE center island that opens up to 2-story family room w/tons of windows. Loaded w/upgrades which include handscraped wood floors in the dinning rm, commercial grade appliances, retractable blinds in the family room, oil rubbed bronze hardware throughout etc. No"
"ABSOLUTELY BEAUTIFUL home with breathtaking panoramic views in highly desired Mountain Lodge! Versatile floor plan with two master suites (down & up), secondary bedroom & full bathroom downstairs, 3 BR's upstairs, storage room, dining room, game room, & media room! Gourmet kitchen w/ gas cooking, granite, & s/s appliances! Large backyard retreat backing to a greenbelt! No stairs at the front, back, or garage entrances! Cul-de-sac! Amenities: Gated, 2 pools, 2 baby pools, & b-ball court! NEISD! N"
"STUNNING 3442sqft, 4Br 3.5Ba Mercedes Home in sought after Mountain Lodge. Open floorplan w/Master down & 3Br's, 2Ba's & gameroom up. Hardwood floors & Tile throughout(NO CARPET). Oil Rubbed bronze plumbing & lighting fixtures throughout, granite tops in kitchen & master bath, stainless steel appliances, ENORMOUS COVERED PATIO that spans the entire width of home w/fireplace & huge outdoor kitchen w/granite tops, sink, refrigerator etc. NEISD Schools, NO CITY TAXES, gated community w/amenities. 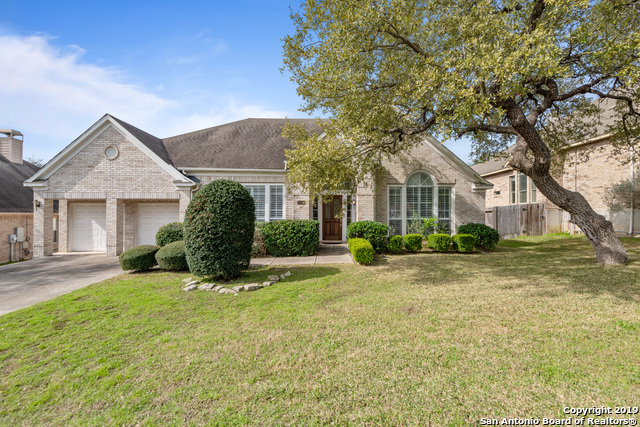 G"
"Reagan High School, Stone Oak Area Close to Canyon Springs Golf Course on a Culdesac, Open Floor Plan, with plenty of room, Large Game-room, Luxury Master with sitting room and fireplace, garden tub, huge shower. Large Kitchen and wrap around covered patio, large backyard great for a pool.Priced too sell ." 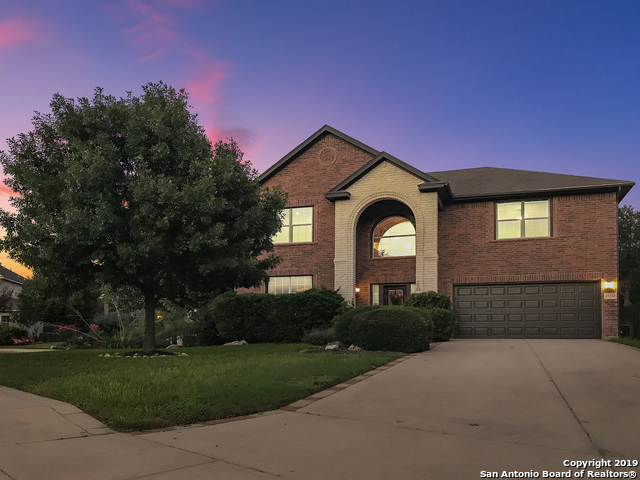 "*Rare find with beautiful views of San Antonio! 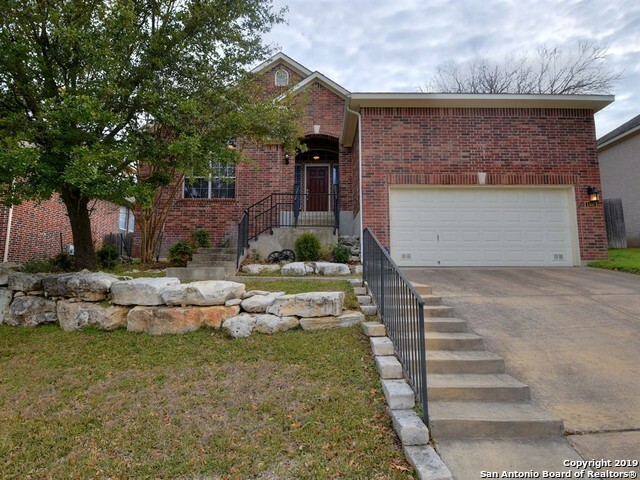 * This 3904 sq ft home shows pride in ownership and is located in one of the most desirable school districts in San Antonio. The home boasts 5 bedrooms, 3.5 bathrooms, a media room (includes recliners, projector, and screen), and a game room (includes pool table). Plenty of style and comfort for the whole family! All kitchen appliances, including refrigerator, will stay with purchase." "Beautiful new construction home in the sought after Mountain Lodge subdivision. This home boasts a large master suite and a secondary bedroom and bath downstairs. Upstairs are 2bedrooms, jack-and-Jill bath and a large game room. The home has picturesque views and sits on a quiet cul-de-sac. It is nestled on a very private wooded lot and has a three car garage. Part of NEISD schools and the highly acclaimed Johnson High School. Don't miss out on this great opportunity! Estimated completion end of"
"This ONE STORY home sits in a cul de sac street on a LEVEL LOT in the beautiful area of Mountain Lodge. From the island kitchen with plenty of cabinets that opens to the family living room, you can always be involved from dining to entertaining. All bedrooms are wonderful size with great closet space. Master has separate tub and shower with walk in closet. One guest room has its own on suite and two others share 1 bath. All of this with 2 living areas overlooking the grand backyard space." 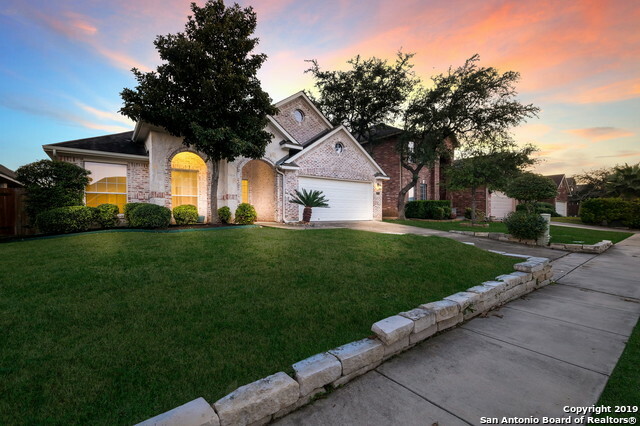 "Beautiful home in the Stone Oak area on greenbelt. 5th bedroom is currently used as an office but could also be used as mother-in-law quarters as it has a full bath. Upstairs bathrooms, including a jack and jill bath have been upgraded with granite counters tops and fresh paint. New roof just installed, newly painted exterior, new garage door and updated backyard covered patio. This home has been very well maintained. Gated community. Don't miss out, will go quick! Open House 4/6/19 1-3pm & 4/7/"
"Stunning home in Mountain Lodge, over 3,400 sq ft of open space! 4 bedrms, master suite down, 3.5 baths, true jack & jill upstairs. 3 living spaces-living rm/dining rm combo/flex space. Fam room w/corner fireplace, lots of light from windows. Huge gameroom upstairs w/Juliet balconies overlooking downstairs. Beautiful open kitchen w/upgraded cabinets, stainless appliances, bight & sunny breakfast rm that leads out to patio & park like backyard. Great 15x4 pantry. Gorgeous sunset views! Super HOA "
"Home in the gated community of Mountain Lodge!!! The kitchen has a new stainless dishwasher, backsplash, breakfast nook & opens to the living room featuring a cozy fireplace. Outdoor entertainment is a breeze with a second level terrace, & perfectly landscaped backyard. Neighborhood amenities include access to community pool. 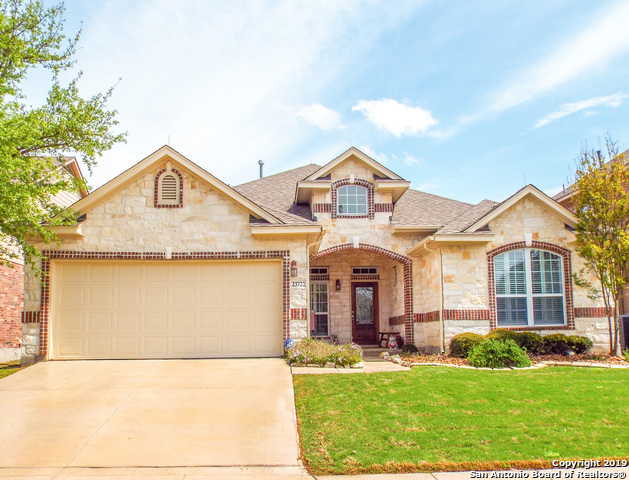 The ideal move-in ready home in great location near Highway 281, Shopping and Entertainment. Access to Sought After North East ISD Schools." "Absolutely gorgeous home in highly desired Mountain Lodge! Open & spacious floor plan with upgrades throughout! Light & bright island kitchen w/ Silestone countertops, new cooktop, & breakfast bar! Formal dining, study, game room, & downstairs guest retreat. Spacious master retreat w/ bay window! 2 new HVAC systems, new carpeting, & so much more! Oversized garage, mature trees, lush landscaping, & large deck that's perfect for entertaining! Cul-de-sac! 2 community pools & park! No city taxes! WE"
"Beautiful two story all brick home on a huge corner lot in the highly desirable Mountain Lodge. Bright, spacious layout that is great for entertaining with 2 master bedrooms & secluded game room. Large kitchen w/granite counters, subway tile backsplash, large walk-in pantry and all matching s/s appliances. Granite counters and upgraded light fixtures in bathrooms. Lots of storage! Full Sprinkler system and the large backyard is an outdoor retreat w/ 20x30 deck and mature trees. NO CITY TAXES!" "BEAUTIFUL!! 2317sqft, 4Br 2.5Ba Ryland 1-story in highly sought after Mountain Lodge just down the street from community pool. The home has tons of curb appeal w/rock & brick exterior on all 4 sides & a covered front porch. HUGE kitchen w/large center island & tons of cabinet/counter space. Rock accent around the breakfast bar & fireplace. Awesome extended covered patio with wood burning fireplace & brick laid tile. 20inch tile floors through out expect for 2 bedrooms. NO CITY TAXES!! NEISD SCO"
"Striking rock/brick family home on quiet Cul-de-Sac in a gated Stone Oak area** Reagan HS**short bike ride to Tuscany Heights Elementary**Huge backyard and covered patio for weekend cook outs**New Roof**New Carpet**wood-like tile** Eat-in Kitchen has room for many cooks**Lots of cabinets* Flowing, open floorplan invites entertaining! 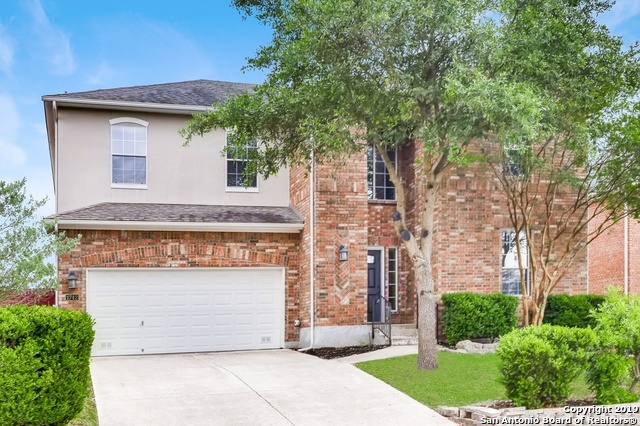 **Gas Fireplace and plantation shutters in Family room**Wrought iron stair case** Private Master Suite has jetted tub/sep shower and double vanity**Upstairs bonus r"
"Move-in ready 4 bedroom home in the beautiful neighborhood of Mountain Lodge! This home features a spacious backyard with patio and mature trees, two living areas down along with two dining areas and a game room upstairs. Kitchen and breakfast area open to family room with a fireplace and lots of windows looking out to the perfect backyard. 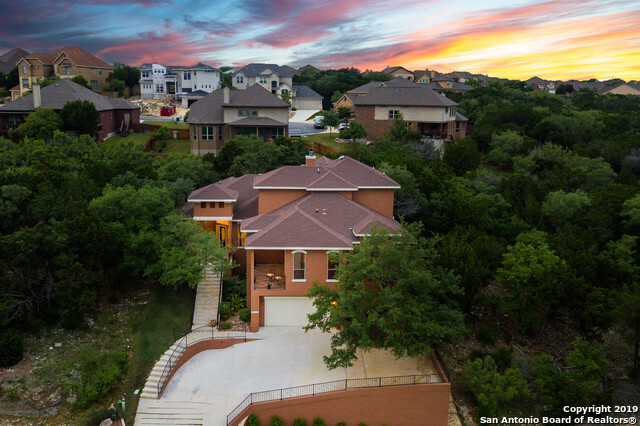 Lovely master suite with a large balcony overlooking the San Antonio hill country. Don't miss the wonderful neighborhood amenities including pool and basketb"
"Immaculate home in Mountain Lodge! Conveniently located near Hwy 281 and Wilderness Oaks. This home prestigious in every way; 10 foot ceilings, rounded corners, crown molding, art niches, 42' cabinets, granite countertops in kitchen. Beautifully landscaped front yard with rock ledges and stone planters. Spacious with multiple living areas and a study. Kitchen has gas cooking and two ovens. Plus, an awesome sunset views from front entry!" "Don't miss out on the most affordable home in highly desired Mountain Lodge! Open, spacious, & versatile floor plan with 2 living areas (one could be a study), formal dining, game room, & 3 spacious bedrooms! Fresh neutral paint throughout the home (11/18), granite counters, gas cooking, & so much more! Relaxing master suite with spa-like bath! Easy to maintain backyard w/ full sprinklers & large custom deck! Gated! 2 community pools, 2 baby pools, park, & b-ball court! NEISD! No city tax! WELCO"
"Don't miss this spectacular GREEN home by Green HomeBuilders, LLC. This single story home has an open floor plan and features 3 bedrooms and 2.5 baths. The kitchen has built in oven, gas cooking and granite countertops. Dramatic architecture enhances lush amenities drenched in natural light under lofty ceilings with a rich package of energy efficient and environmentally responsible features. Located in a great gated neighborhood with numerous amenities included pool, park and sports court."